The new and innovative GutterFlo mesh prevents blocked gutters, without restricting the flow rate in the gutter. Independent testing has been carried out at BRE Building Research Establishment to ensure that GutterFlo can be installed with no restriction of the flow rate in the gutter. It is one of the only products on the market to achieve this. Many are not aware that gutters have to meet a British Standard Approval for flow rate and any restriction in flow can mean that the gutter does not comply with this approval. 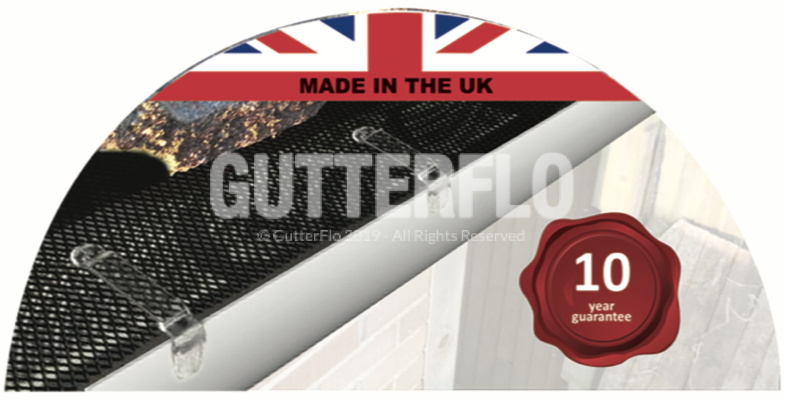 GutterFlo’s unique patented clip design allows for an easy fitting to most types of guttering and allows for variations in the tile position in relation to the gutter. The mesh is strong but flexible and is UV protected. It can be fitted above the tile, below the tile and above the roofing felt/eaves tray or curved into the gutter. There are many products currently available to keep your gutters from getting blocked and maintaining flow, such as The Gutter Brush, Gutter Guard and Gutter Grid, but they all suffer from 2 problems. Firstly, they all reduce water flow, and in the case of the Gutter Brush significantly as it is taking up most of the space in the gutter. This means that in heavy rain, they will overflow and fail in their job. GutterFlo is the only product which alleviates these problems. Its mesh design allows 100% water flow and it can curve up either over the tile or between the tile and felt to allow debris to fall away maintaining its function. GutterFlo has been independently tested by the Building Research Establishment (BRE). You can Read their test report.